CYBORG:Lee Majors Online | Press Room | The Lee Majors Affair, A Minor Matter? THE LEE MAJORS AFFAIR, A MINOR MATTER? ”My girlfriend Connie and I went to Mammoth to ski, that’s all,” Sally reported. “We just went up there to ski – and naturally to have fun. Who doesn’t?” It was to have been just an average winter weekend out of town, like so many Los Angeles residents enjoy. Except that Sally Field, as she herself well knows, isn’t an average young resident of Los Angeles. She is a popular, well-recognized star – which presents certain problems to someone who just wants to join the crowd like an average citizen – someone who doesn’t want to be pointed out, stared at, trailed by strangers. It’s not that Sally doesn’t value her popularity with the public; she does. And she is always gracious and cooperative as far as her fans are concerned. But there are times when even the most sociable star craves the opportunity to just be herself and to have fun. This was one of those times for Sally Field. Sally giggled delightedly, her bright eyes gleaming as she recalled with impish enjoyment her success at pretending to be someone else. Indeed Lee Majors was making a movie – his very first –called Will Penny. It’s Lee’s big opportunity to become a top motion picture star, just as he has become a top TV star via his role in The Big Valley series. The Will Penny company was on location in Bishop, California, just a short distance from Mammoth. That explains why, on weekends, Lee Majors could so easily drift over and catch a fast run or two down the slopes – or join the après-ski crowd in one of the local clubs. It was all very much fun - especially when Sally, long the apple of Lee’s eye, showed up unexpectedly. 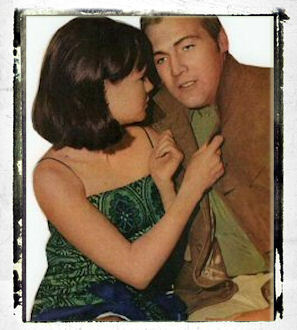 Lee’s fondness for Sally has long been known around Hollywood. He’s made no bones about the fact that he finds the effervescent star of The Flying Nun, ABC’s new series, to be just about the cutest, most attractive young gal he’s seen in a long time. The two even had their pictures taken together for a magazine cover. To see them together is to think that these two are a perfectly matched couple – that indeed theirs must be more than a casual relationship. Appearances granted, the reality is not so. It’s not that Lee Majors hasn’t wanted the situation to be different. He’s asked Sally Field for dates on numerous occasions. And she’s accepted. After all, Lee is a handsome and personable young man. 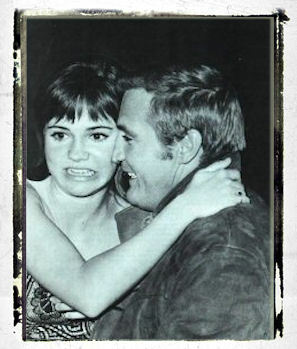 Sally Field personifies perfectly the type of girl that Lee Majors likes. 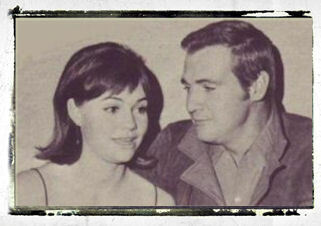 She’s the same type as Patti Chandler, who has been Lee’s ‘steady’ for a long time – although the future of that romance is still uncertain. She’s the same type as Mary Ann Mobley, a former Miss America who’s stormed Hollywood. Although Sally is younger than both of these beauties, she is basically the same type of woman – grown up but maintaining the wide-eyed, eager for life attitude that is most often found in very young girls. It’s a quality that can be very appealing. Every single time that Lee and Sally have made plans to go out together, something has prevented their doing so. Some studio commitment or business necessity has intervened repeatedly. Therefore, despite great efforts on Lee’s part, he’s never been able to have even one date with the girl he finds so endearing. They’ve laughed about it over the phone, even if Lee’s laugh is a bit rueful. And Sally was laughing a bit ruefully herself as she told us, “That evening, it all started again. I wanted to go in this nightclub to be with the rest of the gang and hear the music. But they wouldn’t let me in because I wasn’t 21 yet. I will be in six months, though,” the petite star added hastily. “Anyway, I didn’t want to drink,” Sally insisted. “I just wanted to be with everybody else. Besides, I couldn’t get away with anything if I tried, because I look so young,” she admitted disgustedly. “So I sneaked in,” Sally said triumphantly. “And I hid, so I could listen to the band. Suddenly, there was Lee again, wanting me to have dinner with him. “I guess our conversation began to draw attention – after all, he was Lee Majors,” Sally modestly opined. “At any rate, everybody started looking our way – and I was trying to hide, for Pete’s sake. Looking at her, it’s easy to see why. She doesn’t look a day over 16. And with her pert ways, her tiny size, and that marvellously infectious giggle, it is easy to see why she is always spotted when she tries to act older, why she was discovered that particular night. Lee meant that as a joke. Actually he had forgotten that Sally still had several months before reaching her majority. Furthermore, as Sally herself realized instantly, Lee quickly grasped on the idea that if Sally was barred from this club, she could then go to dinner with him without having to worry about her friends. It was all very funny. Except that it very nearly turned out to be all very tragic. Sally tried to joking to break down the man’s anger, tried to explain that everyone was just having fun. It didn’t work. “As this guy was hauling me out of the door,” Sally said, “Lee yelled out at the manager: ‘I caught this girl trying to pass a fake I.D.’” And Sally was trying to remain anonymous! But by this time Lee Majors was realizing that the whole situation had taken a turn he hadn’t anticipated. He was horrified to think he’d caused this whole situation. “Poor Lee, “Sally recalled. “He thought he’d sent me to the big house. And I rather thought I was up the river myself. When she recovered from her fear and shock, Sally raced back down to her room at the lodge as if all the devils in the world were punishing her. Her whole weekend had been wrecked – so much so that she and her girlfriend headed back to Hollywood early the next morning. Lee Majors completely upset by the unexpected turn his joke had taken, tried to straighten things out with the nightclub manager. He let the man know exactly whom he had been manhandling so roughly – how he’d sent The Flying Nun flying out of his cozy club into the midnight snow. It’ll probably be a long time before Sally lands in The Big Valley – or Lee lands a date with The Flying Nun.